Four wheels moves the body but two wheels moves the soul. 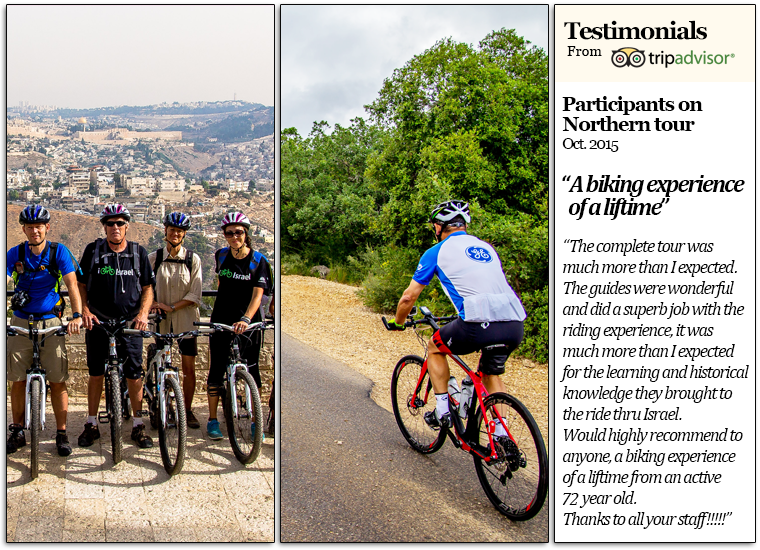 It may explain why Israel is the perfect destination for a bike tour. Dan Active takes you on a cycling adventure and a uniquely dynamic way to experience Israel at its best: breathtaking scenery, fascinating history, iconic sites, phenomenal food and wine – with the comfort, luxury and attention to detail of the renowned Dan Hotels. 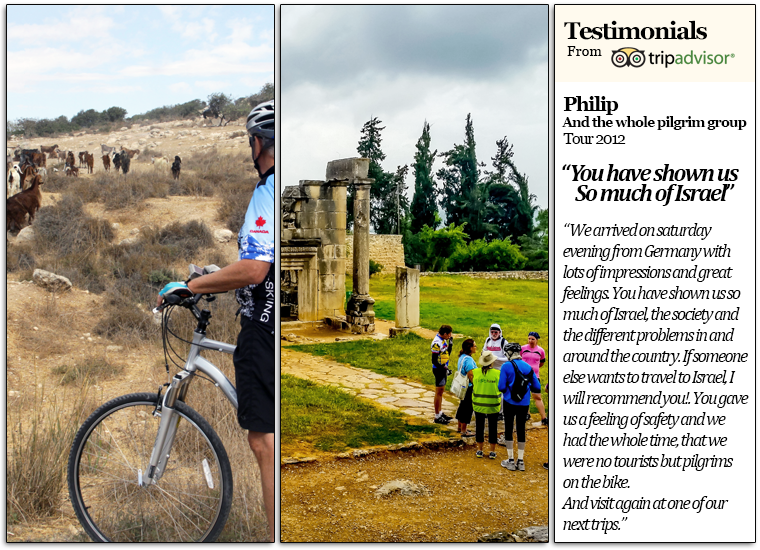 With wheels on the ground, we will guide you on a bike trip through Israel with an utterly unique perspective. Feel the warmth on your back as you pedal under cloudless Mediterranean skies through changing sceneries of scenic and natural diversity in one of the most liberating and invigorating activities you can do. For seven or eight nights, your cycling adventure will combine exciting routes with the pampering and well-earned luxury of Dan Hotels. You will enjoy unforgettable moments in front of world famous sites, be fascinated by the off-the-beaten-track jewels, entranced by ancient history and captivated by the archeology which has made this incredible country what it is today. Whatever your age or skill, the Dan Active vacations are specifically planned, giving you two riding options (from 30-80km each day) and perfectly timed water and snack breaks. You are led by certified and experienced tour guides and accompanied by a support van at all times. With the comfort and reassurance of high quality and fully equipped hybrid bikes, you need only to focus on enjoying this extraordinary journey. At the end of an exhilarating day, you’ll be able to relax and enjoy the luxurious accommodation in the finest tradition of Dan Hotels, and wake up in the mornings to our delicious, nutritious and healthy breakfasts and take in the view. Whether it is the cool turquoise waters of the Med or the Red Seas, the stunning views of the Carmel or the towering walls and exotic markets of Old Jerusalem, you will be changed by this unique experience. Dan Active is a joint venture between Dan Hotels and Gordon Active, providing inclusive packages, catering to all your needs (bike maintenance and equipment, luggage, meals, transportation, security and more) to combine the cycling experience of a lifetime with the pleasure of luxury hotels. From sacred Jerusalem through to the beautiful Negev scenery to the shores of the breathtaking Red Sea, the Dan Active Winter Escape will take you from Jerusalem to Eilat. We will kick off with two wonderful days spent in Jerusalem, including bike tours through the four quarters of the Old City and other fascinating cultural and historic sites. A third day will take us from the pine forests surrounding the city to the incredible natural landscape of the rolling hills and Judean desert, exploring ancient caves dating back over 2,000 years. Then we’ll bid farewell to Jerusalem after three delightful nights spent at the wonderful King David / Dan Panorama Hotel. Next, we’ll spend an extraordinary day at Masada, and then take a refreshing and healthy (yet salty) swim in one of the world’s wonders – the Dead Sea, the lowest natural point on Earth. Afterwards, we’ll set off for Eilat, where we’ll check into the pampering Dan Eilat / Dan Panorama Eilat Hotel and enjoy a relaxing evening. Our first day in Eilat will be spent exploring the city, visiting both the Egyptian and Jordanian borders and enjoying the golden beaches. The next day, we’ll tour the region, including beautiful natural and archeological sites, and an amazing scenic ride. On the final day, we’ll say goodbye to our luxurious hotel, and begin to travel northwards – with a stop at the natural and unique wonder of the Ramon Crater, followed by a ride to an ancient Nabatean stronghold and visit to the memorial to Ben Gurion, one of the founding fathers of the State of Israel. Then, we’ll board the bus back to the airport. From lively Tel Aviv to alluring Caesarea, the towering Carmel to the stunning Galilee, and the mysteries of Jerusalem, the Dan Active’s bike tour of northern and central will take in many of the country’s greatest attractions. At the end of the day, you will take a well-deserved break at luxurious Dan Hotels – the perfect setting to reflect, relax and revitalize after a long ride. 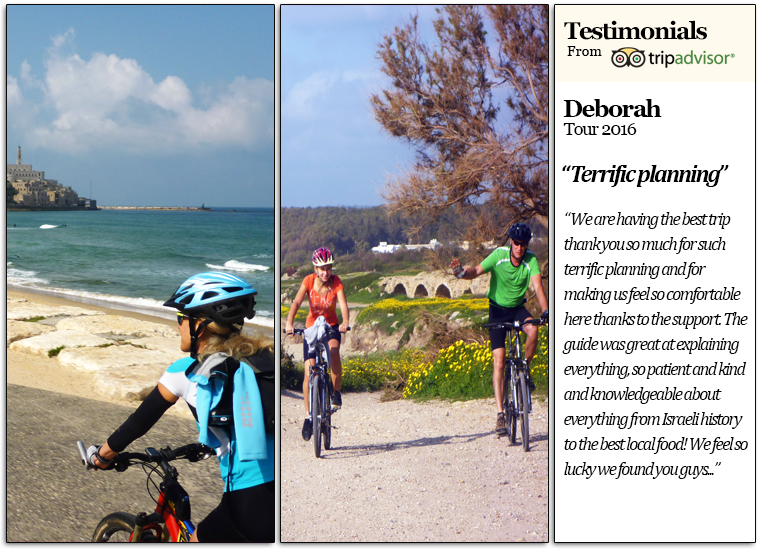 After check-in at the Dan Tel Aviv / Dan Panorama Tel Aviv Hotel, our tour will begin with a bike ride around the city before heading off to coastal Caesarea, where we’ll stay at the relaxing Dan Caesarea Hotel. Following a morning tour of Mount Carmel, we’ll experience the beauty and archeology of the ancient Roman harbor, and enjoy the hotel’s fantastic spa and pool. On our way northwards, to the Dan Carmel Hotel overlooking Haifa, we’ll visit the historic cities of Safed, the ancient city of Acre, and then ride down to the beautiful northern Mediterranean coast. The next day, we’ll head out to the beautiful Sea of Galilee, and cycle through some of Christianity’s holy sites – Mount of Beatitudes, Capernaum – and alongside the majestic River Jordan, advancing southwards, enjoying a picnic on the way and swimming in natural springs and pools. After checking into Jerusalem’s famous King David / Dan Panorama Hotel, at the end of the day, the final two days will take in the mesmerizing Old City, modern Jerusalem, with its beautiful neighborhoods and national institutions. We’ll say goodbye to the city with a sunrise tour of the magnificent Old City, and say adieu to the hotel with a deluxe late breakfast. A cycling holiday to remember. The truly memorable way to experience the country.